We recommend the use of a thermowell in conjunction with a bimetallic thermometer when the application involves a corrosive medium, high pressure, or high flow velocity. Perfect for applications requiring protection for unarmored liquid-in-glass test thermometers, or other temperature sensing elements with a maximum diameter of .25”. These #20 gauge bimetallic thermowells meet or exceed SAMA specifications and are also available in heavy duty, flange, socket weld, and Van Stone models. 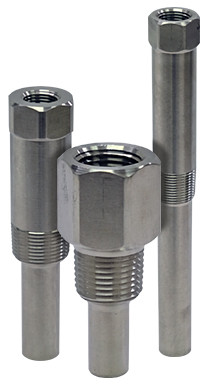 Standard thermowells are made of 316L SST and are stepped to 1/2” OD, except for 2½" insertion. Straight shank models are also available. The standard process connection sizes are 1/2"-14 NPT, 3/4"-14 NPT, and 1"-11 1/2 NPT, with other sizes available. Materials of construction include 316L stainless steel (standard), 304 stainless steel, and brass (ASTM B-16). A cap and chain for keeping the thermowell bore clean when not in use are available upon request.